I really like this postcard. It's an area that I knew very well 35 years ago, as I worked quite close by. 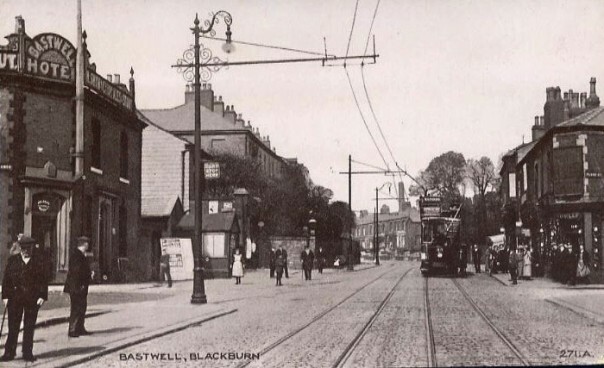 We used to sometimes have a pie and a pint in the Bastwell Hotel, on a Friday lunchtime (our pay day). Most of the properties in this photograph, are still standing. We have Plane Street off to the right (click the photo to expand it) and Whalley Range to the left. Today, it is still a busy crossroads, but now has traffic lights and parked cars there, to spoil the view. By 1950 the traffic lights you mention were there and the shop on the corner of Plane Street (right of photo) was the Post Office. The first house in the terrace on the left was Dr Zimmerman's surgery - a large imposing house with a path winding up through the garden to the front door. On the left side of Whalley New Road before the junction (coming from the town centre) was a barber's shop known as Bob's. My Dad took me there for haircuts but my Uncle said Bob used a knife and fork to cut hair! Opposite Bob's was a butcher's shop which my Uncle owned and lived at for a number of years in the 50s. Thanks for that Peter. I think the shop on the corner of Plane St was a Post Office right through to the 1980's (or was it a chemist?). It was a PO in the 50s but might have changed later. But there was a chemist's shop near Bob the barber - this would be on the left of the photo if it had been taken with the photographer standing further back. Sorry, I should have posted my information below your later Bastwell image at the top of the page where other people have posted. I've been thinking about it myself Peter and the one on the corner of Plane St was still a PO through into the 80's (possibly later too). And I do recall a chemist on the left hand side, on the town side of the traffic lights (lower down, as you say).